Garage supervisors plan, organise, direct, co-ordinate and participate in the day-to-day running of garages and specialist vehicle maintenance and repair establishments. 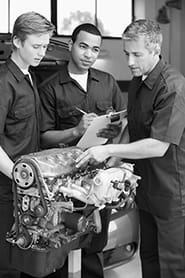 Confer with customers to obtain descriptions of vehicle problems and to discuss work to be performed. Estimate costs and time required for repair or maintenance of the vehicle. Plan, organize and coordinate the day-to-day running of the garage, e.g. by writing work orders and by arranging for garage staff to perform necessary maintenance and repair work on vehicles. Repair, maintain and service vehicles and their mechanical and electronic components. Ensure that necessary spare parts, materials and equipment are available or obtainable at short notice. Check the activities in the garage, inspect completed work for compliance with safety and other statutory regulations, and make sure defects are repaired or adjusted. Maintain records of repair and service work, and make reports to detect recurrent faults. Make sure the vehicle is returned to the owner in a clean and decent state. Provide information for staff about latest developments, technical specifications of new cars, garage merchandise, etc.